Jennie Dembowski chooses to make an apple mixture spiced with cinnamon, ginger and allspice to give the flavor of American apple pie. She then tops it with vanilla bean custard for her Apple Pie Crème Brulée recipe which is her "Custard and Meringue Week" signature bake. 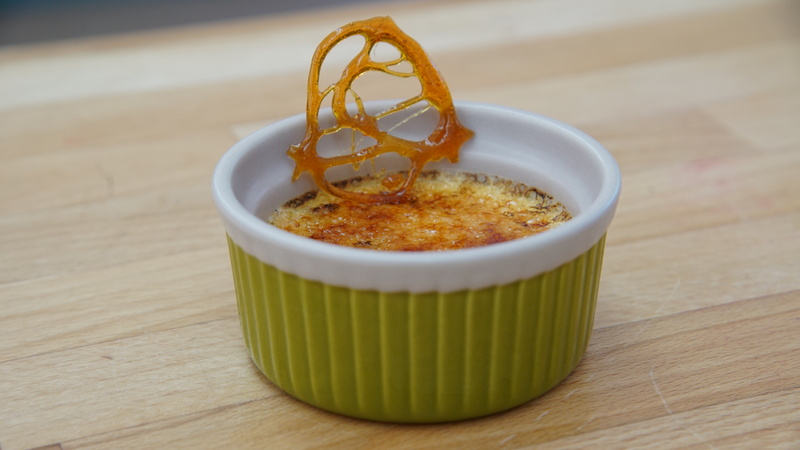 This recipe is one of her husband's favorites and she hopes the judges will like it too, even though it is unorthodox to put an apple pie mixture at the bottom of a crème brulée. Watch the full episode of "Custard and Meringue Week" from Season 2 Episode 6 of The Great American Baking Show. 1. Peel and cut granny smith apples into small chunks. Add to saucepan and cook over medium heat with light brown sugar, water, cinnamon, ginger, and allspice. Cook for approximately 5 minutes or until tender. 2. Place apples in a strainer and strain juices. Place generous ½ tbsp apple mixture into each ramekin dish. 2. Prepare two 9-½ " x 13" aluminium pans (with handles if possible) by placing a small hand towel in each pan. Place 6 ramekins in each pan, leaving a small corner open for pouring water for ban marie. Boil water in tea kettle to use as a ban marie. 3. Place 2 cups of heavy cream into medium saucepan. Cut vanilla bean open, scrape out seeds and place seeds along with bean into milk. Bring heavy cream and vanilla bean to a boil, then let the mixture cool for 5 minutes. 4. Separate 12 egg yolks into medium bowl and whisk until combined. 5. Add remaining 2 cups of heavy cream to cooled milk. 6. Add about ½ cup heavy cream into eggs while whisking, then slowly add remaining heavy cream while continuing to whisk until mixture is combined. 7. Strain mixture, then divide into prepared apple filled ramekins. 8. Bake at 300º F for 30-35 minutes or until slightly set. 9. Make caramel garnishes by bringing sugar and water to a boil in a heavy-duty saucepan. Cook until medium amber in color. Drizzle designs onto silpat, top each with chopped dried apple, and let set. 10. Place baked creme brulees into refrigerator for 15-20 minutes to set. 11. Place oven on broil setting and check position of broil arrangement. 12. Sprinkle about 1 tsp turbinado sugar on each prepared ramekin. Blow torch until caramelized.